Most Americans’ response to the Civil War depends on which side of the Mason-Dixon Line they were born. And they can endlessly discuss the causes of the war and its meaning. Was it fought to end slavery, or to impose Northern industrial power on the agricultural South? Was the Confederacy an evil attempt to perpetuate racism or a noble attempt to protect its native soil and individual rights? But when you are standing in Bloody Lane, you can’t pick sides. It no longer matters who was right and who was wrong. Before Sept. 17, 1862, the brief dirt drive was called the Sunken Road, and it was a shortcut between two farm roads near Sharpsburg, Md. All around were cornfields rolling up and down on the hilly Appalachian landscape. The narrow dirt road, depressed into the ground like a cattle chute, now seems more like a mass grave than a road. And it was just that in 1862, when during the battle of Antietam Creek, Confederate soldiers mowed down the advancing Federals and were in turn mowed down. The slaughter was unimaginable. Even today, with the way covered with crushed blue stone, the dirt underneath seems maroon. Perhaps it is the iron in the ground that makes it so; perhaps it is the blood, still there after 135 years. Antietam was the worst single day of the Civil War. 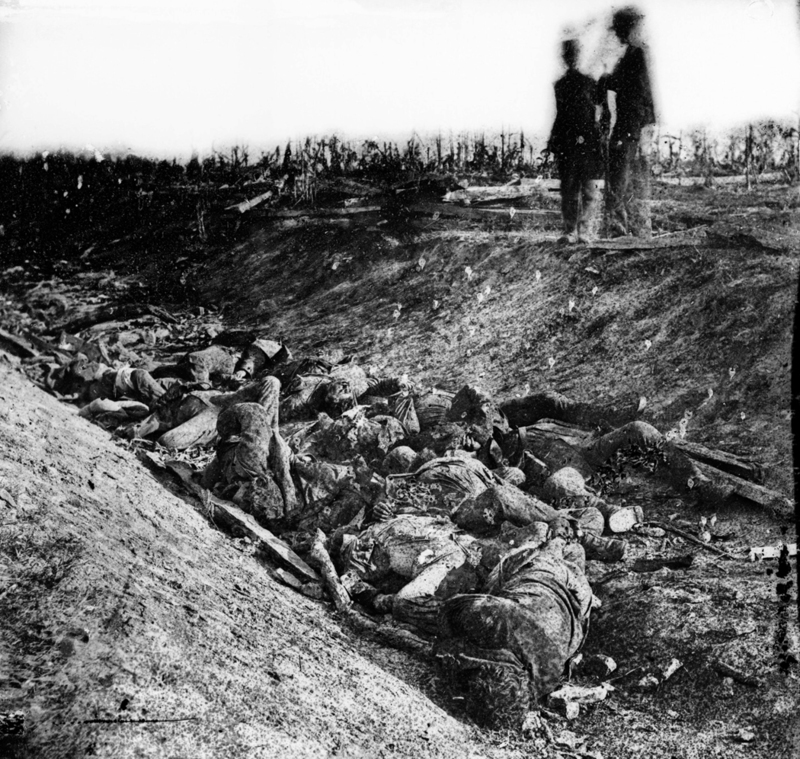 Nearly 23,000 men were killed or wounded. They were piled like meat on the ground and left for days before enough graves could be dug for them. There were flies, there was a stench. The whole thing was a fiasco, for both sides, really. Robert E. Lee had taken his Confederate forces, numbering about 40,000 men, into the North, intending to take Union supplies at Harrisburg, Pa. It was a strategic move that Lee hoped would lend the Confederacy enough respect so that England would recognize the presumptive nation diplomatically. This, many Southerners hoped, would force the Union to negotiate a peace with the seceding states. But he didn’t get farther than Maryland before the Union, under the sluggish General George McClellan, showed up with 87,000 men. 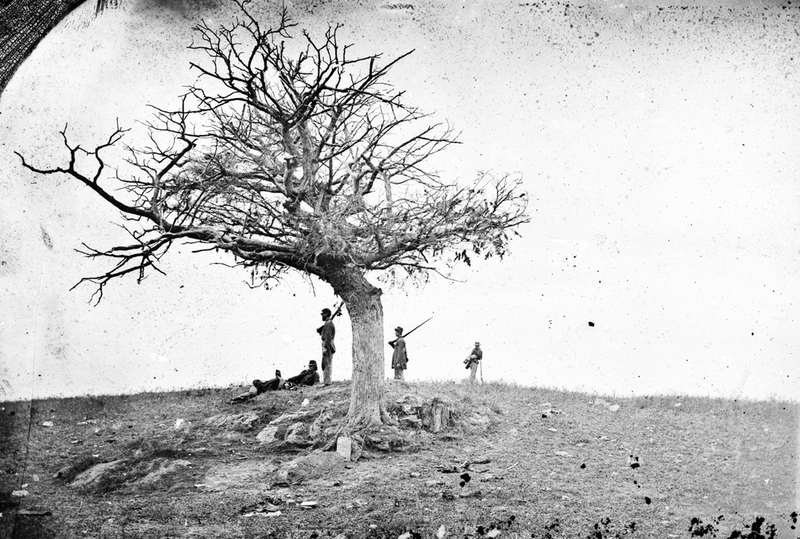 After a period of jockeying for position, Lee wound up with his troops in a long line, running north and south along Antietam Creek and through the town of Sharpsburg. The Union approached from the east. Lee braced for a battle, but McClellan hesitated. When he attacked, his battle plan was botched by his field commanders. In the early morning, his men attacked the north part of Lee’s line. They fought relentlessly for several bloody hours, only to reach an exhausted standoff. 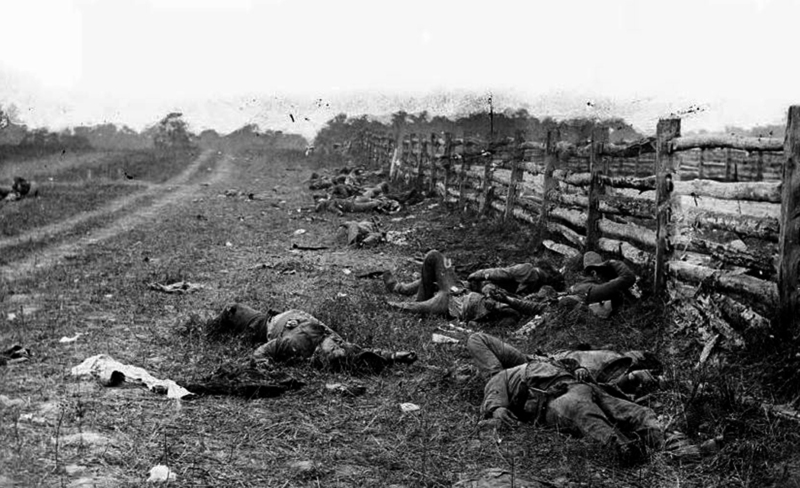 In the middle of the battle, the Union soldiers attacked at about 9:30 a.m. That is where the Southerners had set themselves in the Sunken Road. It was a perfect defensive position, and when the Federal troops marched over the rise a few tens of yards above the road, the fire devastated their ranks. 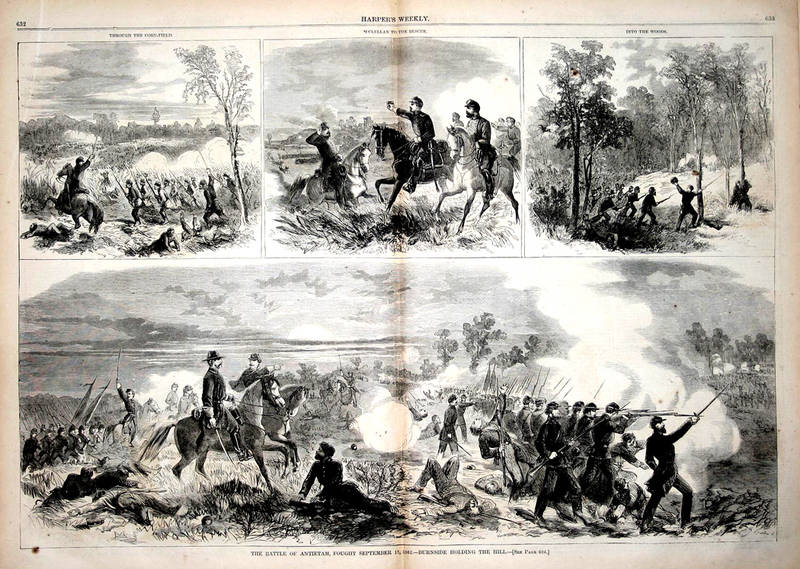 For four hours, the battle went on, soldier falling on dead soldier, and at the end, the Confederate commander at one end of the road misjudged an order, and retreated, opening up the end of the road to Northern reinforcements. Given a clean line of fire on the remaining Rebels, the Yankees hacked through them like machetes through a jungle. That is where the midden of bodies came from that filled the hollow of the road. Later that day, along the southern boundary of the battle, the Yankees tried to cross a bridge over the creek and were held back for several hours by the Confederates. But at the end of the battle, both Northern and Southern battle lines were nearly exactly where they had been in the morning. The battle had been a pointless bloodbath. The cocky McClellan claimed victory, but he could not say what he had won. McClellan had lost every chance he had been given, hesitating and halting. “It wouldn’t be prudent to fight at this time,” he said at just the moment he might have broken Lee’s line and finished off the whole blood-soaked Civil War in an afternoon. As a result, Lee managed to get his army back safely south of the Potomac River. McClellan had lost his chance. But all these years later, as you stand in Bloody Lane, the grassy margins of the road inclining up around you and the way lined with the criss-cross of split-rail fencing, it doesn’t matter if the soldiers were Yankee or Reb. They were all young, brave, impetuous and dead. It is painful to stand in the declivity, looking up at the mound in front of you, covered in cornstalks in a mid-July day. You can see that when the Yankees came over the rise, they were already close enough to touch. There was no neutralizing distance for your rifle fire to travel, no bang-bang-you’re-dead, no time, no room for playing soldier. Your enemy was in your face and you had to tear through that face with lead, the blood splattered was both Federal and Confederate, in one red pond among the furrows. In four hours on 200-yard stretch of Bloody Lane, 5,000 men were blown apart. In another part of the battlefield, Union General John Sedgewick lost more than 2,200 men in less than half an hour in a charge into the West Woods. I am not a superstitious man. I lay hold of empirical evidence, hard fact. But it is difficult to stand in Bloody Lane and not feel that all the soldiers are still there, perhaps not as ghosts, but as a presence under your boot-sole, there, soaked into the dirt. It is almost, as some cultures believe, as if everything that happens in a place is always happening in that place. The battle was not something that occurred before my great-grandfather was born, but a palpable electricity in the air. You can not stand there in Bloody Lane and not be moved by that presence.